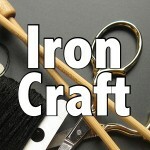 In the honor of the first snow of the season, the Iron Crafters were asked to make something using the color white. 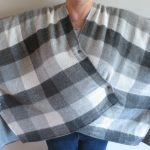 I had to think about this one a bit before I decided I wanted to make something with the quantity of white buttons I had in my stash. The other inspiration for my project was the fact I need to make covers for our throw pillows, the ones we have are not the right colors for the new loft. 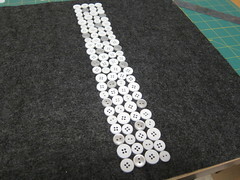 Once I had cut the fabric for the pillow, I played with different ways of laying out the buttons. Finally, I decided a simple stripe down the middle gave the cleanest, most striking look. I’m really happy how the finished pillow looks on the couch. 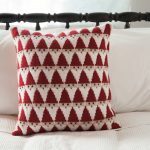 This is not a difficult project by any means, anyone with who can sew a straight line can make it. The hardest part is laying out the buttons in nice straight lines. 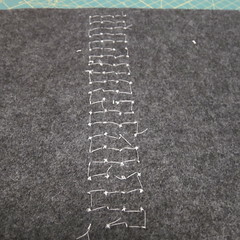 Just take your time, use a ruler and do the glue step before sewing. 1. 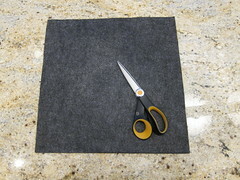 Cut two square from your fabric the size of your pillow insert. So, for my 14″ x 14″ insert I cut 14′ x 14″ squares. This is what gives you a nice full pillow. 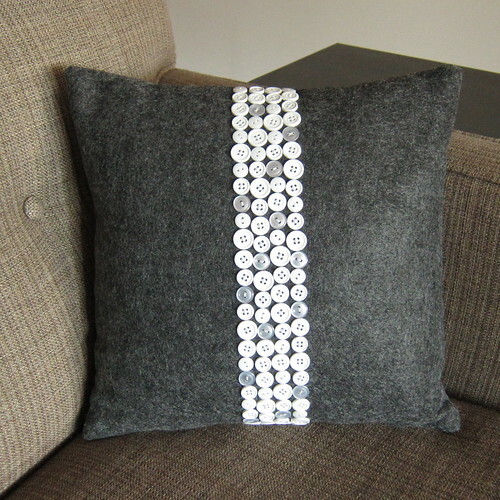 Make sure to leave about 3/4″ space on each edge for sewing the pillow together. 4. Sew the buttons in place. You don’t need to knot off and restart for each button, just keep working down the lines. 5. 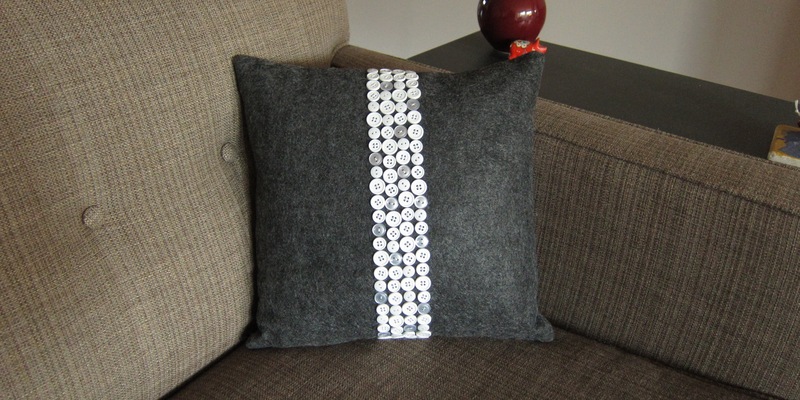 Assemble the pillow by pinning the two pieces of fabric together with the right sides facing in. Sew three sides together with a 1/2″ seam allowance. Turn right side out working the corners out the best you can. Put the pillow insert inside and hand sew the last side shut. Very striking!! I would not have thought to glue the buttons first. What a brilliant idea. Pingback: 16 Button Crafts For The Entire Family To Try! Pingback: Awesome Button Crafts For The Entire Family To Try! Pingback: Amazing Button Crafts For The Entire Family To Try!